Merton is set to welcome the return of the Morden Park Wedding Fair on the 20 March at Morden Park House. The Morden Park Wedding Fair will bring together local exhibitors including photographers, bakers, florists, cars, bridal wear and menswear. The wedding fair will give the opportunity for visitors to plan the perfect day. The event will be taking place from 11am – 3pm with free admission to all. Visitors will be entered into a prize draw with the victorious couple winning a free wedding ceremony. 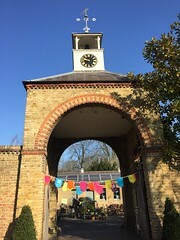 There will also be an opportunity for visitors to view the beautiful Georgian Country Manor House situated in a delightful parkland setting in London.